We had a field trip scheduled this morning in downtown Tulsa, and I remembered late last night that today was St. Patrick's Day, a day when some folks do a little more to celebrate than just put on green and look for someone to pinch. So I got online to see if anything would be going on downtown, and whether that might affect the parking situation. 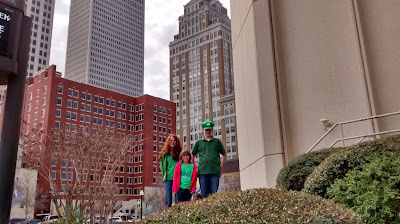 Sure enough, a St. Patrick's Day party was just a couple of blocks from where we would be, and a parade was scheduled to begin within half an hour after our field trip was set to end. So we decided to check it out. Just before the parade, some women stopped us, and asked my older daughter to join the Ginger Brigade and march in the parade. She wasn't sure about that, but I encouraged her to go for it, and assured her we'd be right there to wave at her as she went by. 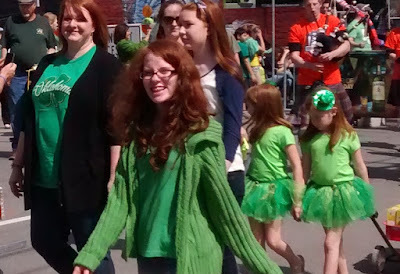 Once the parade began, as you can see, my daughter was all smiles. 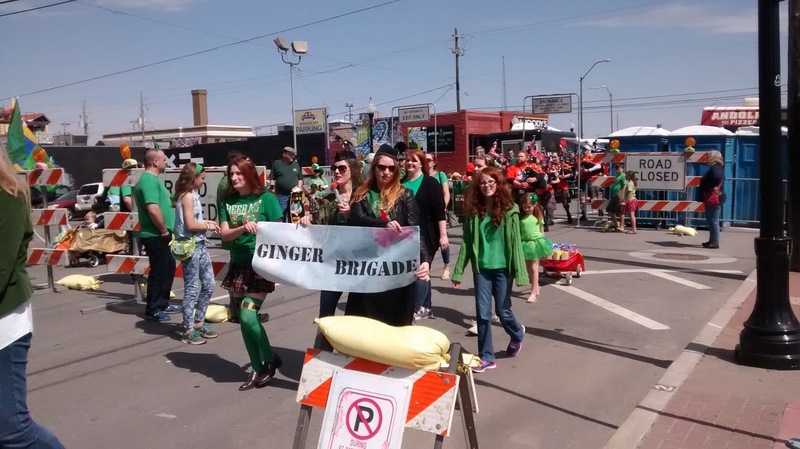 It was her first time to be in a parade, and what fun to have been kidnapped by a bunch of fellow redheads and taken on yet another unplanned adventure! I hope you had a happy St. Patrick's Day, too! Tonight I watched a video called "The Fallen of World War II" that has been going viral on Facebook. It explains in great detail how many people were killed, both military and civilians, in every country involved in the war. It shows the deaths in relation to one another, and spread along a timeline, and even has links where you can interact with the data to learn more. 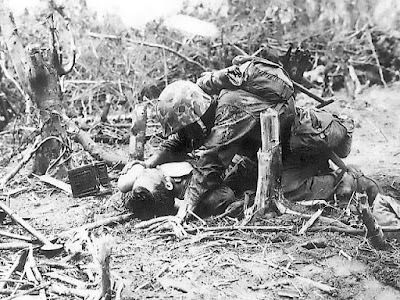 As I watched the video, I was stunned at the sheer number of deaths, and more than that, at how little I knew about various aspects of the war. I have so much to learn. I studied history in high school and college, and was an excellent student. But when I started homeschooling my own children, and learning alongside them, I was ashamed and embarrassed by how little I had even been exposed to in the classes I took. To say that the depth of knowledge presented was shallow would be an understatement. My classes barely skimmed the surfaces of the topics that were covered, and so many topics were left as untouched as pristine, shimmering, newly fallen snow. In recent years, I have dived into long documentaries by Ken Burns and other filmmakers. I have read biographies, autobiographies, and historical accounts of Marines who faced unthinkable horrors in the Pacific, a bomber crew that was shot down behind enemy lines and then beaten to death by a German civilian mob, children who lived through the war on both sides, and more. But I have so much yet to learn. Watching the video tonight, I realized that I know next to nothing about the war on the eastern European front, where the vast majority of casualties occurred. Is it because I grew up in the Cold War, during which any sympathetic reference to the Russians would have been taboo? I don't know. But I want to know. I want to know more about the siege of Leningrad and the mass casualties in the Battle of Stalingrad. I want to know what effect the loss of so many millions of young fighting men and civilians had on the Russian people, and what that means for them and for us today. I feel blessed to be a homeschooling mom. This summer, my kids will be reading both "The Diary of Anne Frank" and "On Hitler's Mountain" - the first written by a young Jewish girl who died during the war and the other written by a woman who spent her childhood just down the hill from Hitler's compound, living in a Nazi family with limited access to any news unapproved by the Nazi regime, but still silently questioning why things were happening the way they were. We'll be watching the Ken Burns documentary, "The War." We've visited our local World War II memorial, dedicated to the men who perished on submarines, and were privileged to meet and talk with a veteran of the war. We've also recently seen FiFi, the last flying B-29 bomber. 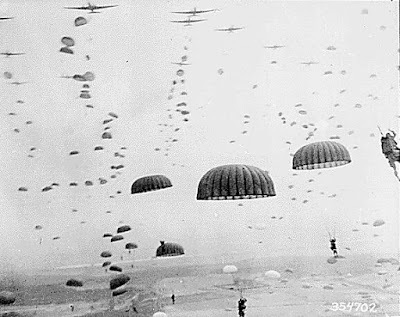 I don't know what else we might do to study World War II, but I think it is important that we continue to learn, and that my kids realize at a much younger age than I did how much there is to learn about this war that truly changed the world. You can watch the video here, and hopefully be inspired to learn more, too.